Spa plays host to the 12th station of the 2017 Formula One Championship. The physically and mentally challenging track has seen a series of technical experiments and changes of power unit elements so far over the weekend. Daniel Ricciardo reverted back to the ‘normal’ medium-downforce aerodynamic configuration after he was trialling a very ambitious and brave setup in Friday practices. Despite setting the best sector times in the first and third segments of the track, the Australian was losing about 1.4 seconds in the middle part. He then reverted back to the medium-downforce level for Saturday. His best time of 1:43.863 was 0.483 seconds slower than the one of his team-mate. Ricciardo’s lost 0.361 seconds from that deficit in the middle section which indicates that the limited time in the third and final practice was not enough to find the best setup for the very different aero configuration. "I just felt a little bit limited with the balance. But I’m going to be optimistic and say, if that’s the case maybe that means we have got a more consistent car for the race. If we’re not getting the peak out of the tyre maybe we can sustain a relatively good pace for longer than the others, so that’s what I’m betting on,” Ricciardo remained optimistic for the race. Force India drivers Esteban Ocon and Sergio Perez both used an extremely low-downforce setup in quailifying after trying out that configuration in the practice sessions. Both drivers set almost identical times in the first and last sectors. Their best first sector time was only a tenth down to the best of Lewis Hamilton while their last sector time was only a tenth and a half down set by the the Briton. However, this incredibly low downforce setup saw Perez and Ocon losing 2 and 2. 2 seconds respectively. Chief operating officer, Otmar Szafnauer added that his team put focus solely on the race where any top speed advantage can pay dividends on the never-ending straights of the Spa race track. Jolyon Palmer has been delivering his most convincing performance over the Belgian GP weekend. THe Briton whose one-lap performance has been no match to the one of his team-mate Nico Hülkenberg so far this season. However, he has had the upper hand in yesterday’s qualifying session. The German proved to be faster by two tenths in the first qualifying segment, but the 2014 GP2 champion set Renault’s best time in Q2 with a 1:44.685 in the entire qualifying session. He then could not join the action for the all-important Q3, but his team-mate did not manage to beat his time despite to the improvement in grip. “It's such a shame as we were going great guns out there,” said the Briton. “Q1, Q2 was easy through and then both my laps in Q2 would have put me in seventh on the grid. So to not even take part in Q3, it's disappointing to be tenth,” he said after the session. Felipe Massa has had a torrid weekend so far. After having missed the Hungarian GP because he felt unwell and dizzy in the car, he returned to action in Spa. The Brazilian had a crash in the first practice session which caused severe damages to the chassis. As the team could not repair it, the damages forced them to change the chassis which is quite rare over a race weekend. As any chassis change requires scrutineering from the FIA, the team had to wait for the check from the technical department of the governing body. 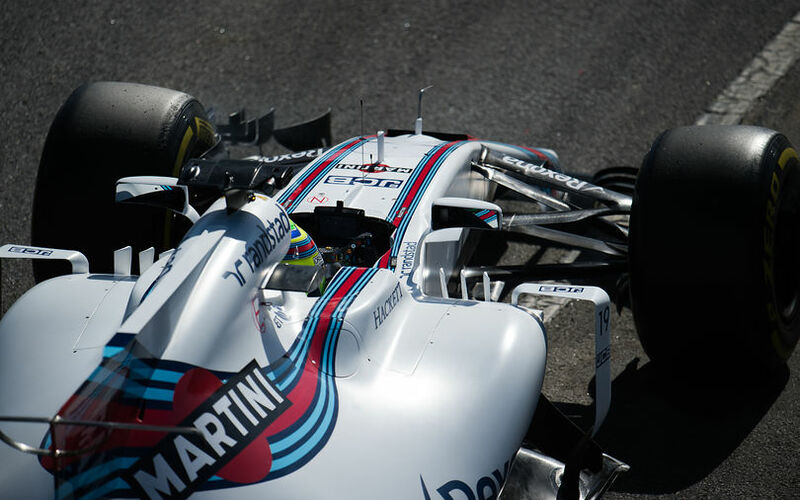 “Today the car number 19, Williams Martini Racing team, underwent preliminary scrutineering. The car was found to be in conformity with the safety requirements of the 2017 FIA Formula One Technical Regulations,” came the confirmation from FIA on Saturday morning. Felipe Massa was downbeat after the qualifying session. The main cause for the disappointment was, however, not his crash, but the lack of competitiveness of Williams on the high-speed circuit of Spa which should have favoured their Mercedes power unit and usual good aerodynamic efficiency on similar kind of tracks. “I’m so disappointed with the result. We’re not competitive enough. I thought maybe the crash would have been a problem today but I managed to understand the balance and the car. The car is just not competitive so I’m pretty disappointed,” the 11-time GP winner sounded disheartened. Stoffel Vandoorne, Marcus Ericsson, Pascal Wehrlein and Nico Hülkenberg will start today’s Belgian GP with a new gearbox. The gearbox change of all the drivers were before the six consecutive events expired. However, the first three drivers of them did not finish the previous race in Budapest which means they were entitled to change the gearbox. Nico Hülkenberg was forced for a gearbox change, but Renault installed a spare gearbox which means the change did not trigger any penalties.